Earl Robert Jones, known by his family and friends as “Possum” , son of James Wilson and Lucy Stokes was born in Nottoway County on February 2, 1933. He entered into eternal rest on Tuesday, December 25, 2018 at Chippenham Medical Center in Richmond, VA.
Earl attended Nottoway Training School. He was a laborer and plumber most of his life. Earl loved watching and going to football games, fishing, riding around talking trash to everybody. He always loved working on things. Everyone loved old “Possum”. Earl was preceded in death by his parents, James Wilson and Lucy Stokes; a daughter, Sherri Yancey; a grandson, Orlando Cabbins; a great granddaughter, Essence Jefferson. 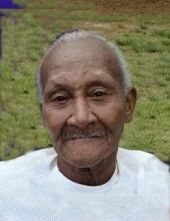 He is survived by his wife, Annie G. Jones; four sons, Robert Jones, Clayton Jones, Thomas Jones and Jay J. Jones, Sr. (Barbara); three daughters, Doreen Jones, Velma Jefferson (Maurice) and Danette Jones; twenty-two grandchildren; twenty-eight great grandchildren; four great-great grandchildren; one brother, Sammy Lee Hicks of Blackstone, VA; other relatives and friends. FunersEarl Robert Jones, known by his family and friends as “Possum” , son of James Wilson and Lucy Stokes was born in Nottoway County on February 2, 1933. He entered into eternal rest on Tuesday, December 25, 2018 at Chippenham Medical Center in Richmond, VA.
To plant a tree in memory of Earl R. Jones, please visit our Tribute Store. "Email Address" would like to share the life celebration of Earl R. Jones. Click on the "link" to go to share a favorite memory or leave a condolence message for the family.